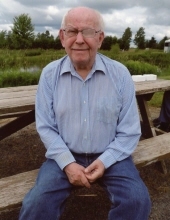 Glenn Ralph Mason of Tomah, Wisconsin passed away on Friday, February 8, 2019 at the Tomah Veterans Hospital. Glenn was born in Milwaukee Wisconsin on August 19, 1931 to harry J and Virginia (nee Knotek) Mason. He lived in Milwaukee, Wausau and Tomah. Glenn is survived by his loving sister Lois Manhardt, dear nephew Richard (Nancy) Manhardt III and dear cousin Ronald (Karen) Reimer. Further survived by other relatives and friends. A funeral service will be held on Saturday, February 16, 2019 at 1:30 PM at Mueller Funeral Home, Cedarburg. A visitation will be held at the funeral home from 12 Noon until the time of service. In lieu of flowers, memorials to the Disabled Veterans National Foundation are appreciated. Glenn graduated from North Division High School in Milwaukee. He worded at Crucible steel in Milwaukee until he was drafted into the Army. Glen was in the infantry as a private E-2. He was in the North Korea Sector on a night patrol when they were hit with combustion grenades, wounding him on March 9, 1953. He was flown to a hospital ship and then to Letterman Hospital in San Francisco. His optical nerve in his left eye was cut and his left arm was injured, requiring a metal rod in his arm and trouble getting skin grafts to take. His elbow and wrist were permanently immobile and he lost his left eye. Glenn returned to Milwaukee, living and caring for his mother Virginia, who passed away at the age of 92. He was involved in church work and a volunteer at the Pabst Mansion. After his mother passed, he moved to Hancock for the summer at the cottage. He then decided to move to Wausau, where he became a volunteer for the Marathon County Public Library, refilling books that were returned. Glenn also joined the Friends of Marathon County Public Library where he sorted and filed books that were donated to set up for the Friends sales, which they had 4 times a year. Glenn also volunteered for the Kayak meets which were held in the summer months. The meets drew international kayakers. He also volunteered at the Leigh-Yawkey Woodsen Art Museum as a greeter and helped with the children’s programs. Glenn also volunteered at the Center for Visual Arts, as a greeter and helped hang the pictures for the shows. In the summer, when he wasn’t busy with volunteer work, his sister would take him to the cottage. On birthdays and holidays his sister would pick him up to join the family for the celebrations and holiday dinners. While in Wausau, Glenn fell and hit his head. The hospital there sent him to the Milwaukee VA Hospital, they evaluated Glenn and sent him to the Minneapolis VA for recuperation, he spent two months recuperating and then they sent him to the Tomah VA for more therapy. The Tomah VA decided he was not able to live on his own and he became a resident of the Tomah VA. His sister would go twice a week to visit him and sometimes take him to visit the cottage or drive to different locations in Wisconsin and then return him to the VA.
During the last two years Glenn fell twice and hit his head, leading to most of his time being spent in bed. To send flowers or a remembrance gift to the family of Glenn Ralph Mason, please visit our Tribute Store. "Email Address" would like to share the life celebration of Glenn Ralph Mason. Click on the "link" to go to share a favorite memory or leave a condolence message for the family.